I had a ton of mentions in the media this week, which was a lot of fun. Hopefully that will continue! I wrote a while back about doing an interview with Dan Bortolotti of Canadian Couch Potato for an RESP article in MoneySense. The article is online – it’s about couch potato investing in an RESP account. 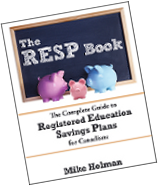 The RESP book got a big mention when Rob Carrick linked to a book review and book excerpt on the Globe and Mail site. I won top prize in the Carnival of Canadian Real Estate hosted by Life as Real Estate Investors. The post was actually written by Rachelle, but I’m keeping the prize. 🙂 I’m hosting the next edition so get your entries in. Any real estate articles are ok (not just RE investing). Thicken My Wallet observes that investing in domestic companies is a safer way to invest in foreign markets. Rob Carrick came up with some neat ways to juice up your GIC yields. I didn’t know about any of these. Beating The Index slams Eric Nuttal in a very entertaining post. Nuttal is yet another equity analyst who doesn’t know sh*t, but spouts off on BNN to further his own interests. Great picture too. Rob Carrick has some suggestions for investing your cash. I have a lot of cash in my RRSP, so I need to get on this. Canadian Personal Finance wonders if cheques are passe. Michael James on Money says that disagreeable financial advisors might be your friend. Money Matters shows us the power of debt. Smart on Money asks would you drink the most expensive bottle of wine? Million Dollar Journey explains the difference between preferred shares and bonds. Wisdom Journal explains how to write a business plan. Canadian Capitalist reports from the frontlines of the discount brokerage price war. Larry MacDonald thinks that TMX Group might be a buy. Thanks for the mention, still reading your book (at work), have had lots of folks ask me about it, and you may get a few more sales there. Have a great weekend! Thanks for the mention! Greatly appreciated. Your book is definitely getting press. Hopefully that will translate into sales. Thanks for the mention. Glad to see your book getting the buzz it deserves. This is a great round-up. I learned some new things from Rob Carrick’s stuff and discovered a couple of new sites. Thanks! Thanks for the link. Looks like you are the media’s go-to-guy on RESPs now! Congrats again on the great book and the media mention and limelight time!